Foampro 60 Rigidgrid 1-GAL Paint Can Grid. Easy Rolling! Here is a great way to roll a smaller quantity of paint directly out of your gallon container. And they cost a dollar! "Bucket grids fits gals. = For stirring and mixing paint. Eliminates messy pouring of paint. Apply paint directly from a 1gallon can with rollers up to 4 inch wide. Snaps under paint can lip for storage and to make room for large diameter rollers. No paint tray needed. 4 inch x 10 inch x 1/4 inch ." This is so simple its stupid. Whether its called a bucket grid or paint grid it doesn't matter. Just pop it in the gallon container and snap it under the lid of the can. You could put it in either way but we find the "handle up" method to be the most secure. Start rolling to your hearts content while you watch others screw around with other buckets, trays and gimmicks. You have seen these on the shelves of your paint stores and wondered, "What is that?" You don't want to ask the help at the counter... you're a professional painter you should know this! Right? Well there is nothing more than a bar code on the product, no lengthy instructions, and it looks weird. The best part about these grids cost around a dollar. 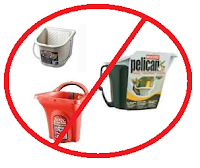 The roller buckets from Wooster, Sherline, or Handypail are costly. Most liners for those gimmick cut pots are costly too and end up filling the landfills with more trash. You already own the container that the paint came in. Why put the paint into another container that is going to need cleaning? When done with the grid take it out of the can and give it a quick wash. Go green and save the planet. Quit throwing away tray liners that just fill up the landfills.